This black-magic assassin will captivate viewers in the newly released trailer. Also, have you ever wondered what an "Odiyan" is exactly? Mohanlal has upped the ante with the release of the trailer for his much awaited flick Odiyan. The actor had raised a lot of expectations with his body transformation and the grand nature of the film and the trailer has only gained greater traction. Mohanlal's last truly "mass" film was Pulimurugan and by all accounts, the hype for Odiyan surpasses even that. The trailer shows Mohanlal in dual avatars of the younger version of his character, Odiyan Manickyan, and a much older and weathered version. This film is the debut venture of director V.A.Shrikumar Menon and is penned by Harikrishnan. Manju Varrier and Prakash Raj are also part of the cast. It promises to be a visual treat. This prehistoric (I'm exaggerating, but creative license applies) legend dates back to the untouched forests of the Malabar region, especially Vallanad. There, the coming of darkness was a thing of terror. Odiyans were dreaded figures who haunted the shadows, preying on targets they were sent to assassinate. They were shapeshifters, men who acquired terrible powers by sacrificing unborn children. With the arrival of electricity, the darkness was driven back and slowly, the legend drifted into oblivion. It will be interesting to see how something as terrifying as an Odiyan is portrayed in the movie but the director has already hinted at a new take on the myth. “One can call it a super-hero movie as Manickyan is a man with great athletic power,” he says in an interview with the Indian Express. In the trailer, it is implied that Odiyan will oppose evil forces as opposed to being a creature feared by all. There are only hints of the supernatural but it certainly is enough to be interesting! 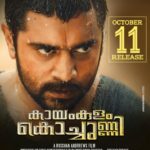 Kayamkulam Kochunni - What's Your Verdict?